Captain Amasa Delano, of the ship Perseverance, of Boston, has received from the King of Spain a Gold Medal, with his Majesty's likeness, as an acknowledgment to captain D. for the humane and spirited exertion of himself and his crew, in rescuing a Spanish merchant ship, in the Pacific Ocean, with a cargo of slaves who had risen upon and massacred the greater part of the Spaniards on board. --Poughkeepsie Journal, September 2, 1807. From The United States Gazette, reprinted in the Baltimore, Maryland Telegraphe and Daily Advertiser, April 24, 1806; and the Weekly Raleigh Register, May 19, 1806. It is with pleasure we record the following heroic conduct of Amasa Delano, of Boston, as well as the liberality with which he has been rewarded by the king of Spain and the government of Chili. Captain Delano commanded the ship Perseverance of Boston; off the island of St. Mary's he fell in with a Spanish merchant ship called the Trial, Captain Don Benito Serien, with a cargo of slaves who had mutinied, and in a most cruel manner butchered the greatest part of the Spanish crew. Capt. Delano did not hesitate a moment in taking the most effectual means of affording the Spaniards every assistance in his power. He laid his vessel along side of the Trial, and boarded her in a resolute manner, at the head of his gallant but small crew, and notwithstanding the vast superiority of numbers, he over came and secured the blacks, and thereby saved the lives of the few remaining Spaniards, whom he also abundantly supplied with water and provisions which began to fail them. Capt. Delano, it is said, has received eight thousand dollars from the government of Chill, and the king of Spain has charged his ambassador near the United States to write to Captain Delano a letter expressive of his thanks, and to present him at the same time a gold medal as a token of gratitude for saving the lives of his subjects on board of the Trial. Capt. Delano is yet absent, but is expected to return to Boston next October; we do not wish, however to delay laying before the public the above particulars, which at the same time that they do honor to our brave fellow citizen are equally honorable to a monarch and a nation who so justly appreciates and rewards the service rendered to humanity. From the American Daily Advertiser. For shame — let slave merchants reward their protectors and tyrants honor the bravery that is prostituted in their cause — but let free-born Americans reprobate the Quixotic valour that saved a handful of White Russians, at the expence of two or three hundred Victims of their insatiable avarice, whose only crime was that of rising upon their Oppressors, to regain that freedom with which God and Nature had endowed them. 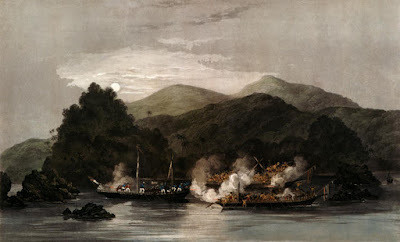 Delano's 1817 Narrative of Voyages and Travels included a chapter on "the Capture of the Spanish Ship Tryal, at the island of St. Maria; with the Documents relating to that affair." As documented in the Northwestern-Newberry Edition of The Piazza Tales and Other Prose Pieces, 1839-1860, Delano's Narrative is Melville's main source for Benito Cereno, originally published in Putnam's magazine and reprinted in The Piazza Tales. "Putnam's Monthly.... Among the continuation papers is a second portion of HERMAN MELVILLE'S "Benito Cereno," (rather heavy reading, so far,)…." --New York Daily Times, October 30, 1855.